Perfect for fans of Carolyn Haines and Donna Andrews, Lillian Bell makes the return with her second Funeral Parlor mystery featuring funeral director Desiree Turner. When an unnatural cause of death finds one of her clients, Desiree must get to the bottom of the murder before she’s fitted for a coffin, herself. Funeral director Desiree Turner deals with death by natural causes all the time. Death by unnatural causes? Not so much. Yet, she and her boyfriend Nate have heard some not-so-dear things about the recently departed. A suspicious remark by the late Frank Fiore’s daughters sparks some concern. And when Violet Daugherty faints behind the wheel of her car, Desiree suspects she’s got a front seat to murder. Desiree can’t help but look into Violet’s untimely end, but soon after, rumors begin to spread that she’s accusing her clients of murder, which quickly spurs a mass cancellation and Desiree is on the verge of going out of business. What began as an effort to do due diligence for her client turns into a wild goose chase for Violet’s murderer. Desiree must find her proof before everything she works for is lost. But that’s easier said than done, because while everyone else in town is looking to take their business elsewhere, the killer sets sights directly upon Desiree. Now it’s up to Desiree to find the murderer before she becomes the next body her funeral parlor serves in If the Coffin Fits, Lillian Bell’s second charming Funeral Parlor mystery. 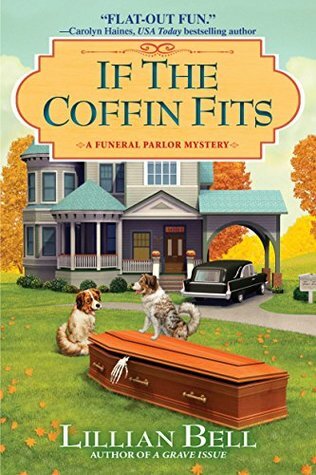 If the Coffin Fits by Lillian Bell is the second book in the cozy A Funeral Parlor Mystery series. Each book in this series does have it’s own murder mystery to be solved however there is an extra mystery going on in the main character’s life that has carried over from book to book. Due to this part of the story the series would definitely be best read from the beginning. This series is centered around Desiree Turner who had returned home to Verbena, California after making a huge error in her job as a journalist. Knowing her family could use the help in the family owed funeral home they operated Desiree thought she take the time to figure out what to do about her career. Now in If the Coffin Fits Desiree is working at the funeral home and working part time for the local paper. As she’s overseeing a couple of recent funerals Desiree overhears a conversation that makes her question the clients and also finds that there’s suspicion surrounding one of the other recent deaths leaving Desiree to search for answers when pushing the local law enforcement to investigate doesn’t work out. One thing I love about this series is the author has formatted the story in a unique way that fits the character quite well. Each of the chapters gives a short news article at the beginning that ties in with what is going on to show Desiree’s journalistic side. The story is also an interesting one with a side of quirkiness that I enjoy so I loved settling in once again with this series. With a cliffhanger end to the personal side of the story I’ll definitely be anxiously awaiting the next installment. Lillian Bell was born in Dayton, Ohio. She moved when she was four and only remembers that she was born across the street from Baskin-Robbins. Lillian remembers anything that has to do with ice cream. Or chocolate. Or champagne. She recently graduated from the Creative Writing MFA program at Antioch University in Los Angeles. This is her second Funeral Parlor mystery. Nice review Carrie. I like that there is a different start to each chapter. I have the first one to read, so should get to it then.